Carotenoids of yellow, orange, and red color are among the most widespread and important natural pigments. They are found in higher plants, algae, fungi, and bacteria, both in nonphotosynthetic tissues and in photosynthetic tissue, accompanying the chlorophylls. Unlike chlorophylls and anthocyanins, they are also found in animals, being responsible for the color of birds, fish, insects, and some invertebrates. 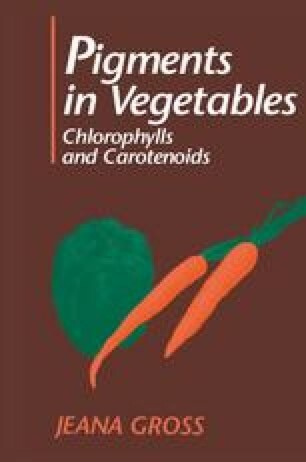 Since carotenoids are synthesized only in plants, plant carotenoids constitute the source of all animal carotenoids. Animal products such as milk, butter, and egg yolk contain carotenoids.